Easy to use, and effectively removes urine and its proteins as well as other soils. Carpet Cleaner: Urine Off Multi-Purpose is an excellent carpet cleaner that will remove most organic stains and odors from virtually all carpet and rug fibers. Use as a pre-spotter and also as a carpet cleaning agent. Upholstery Cleaner: Urine Off will remove most organic stains and odors from upholstery including urine, coffee, cola, and red wine. Urine Off has been awarded USDA BioPreferred® designation as a USDA Certified Biobased Product. 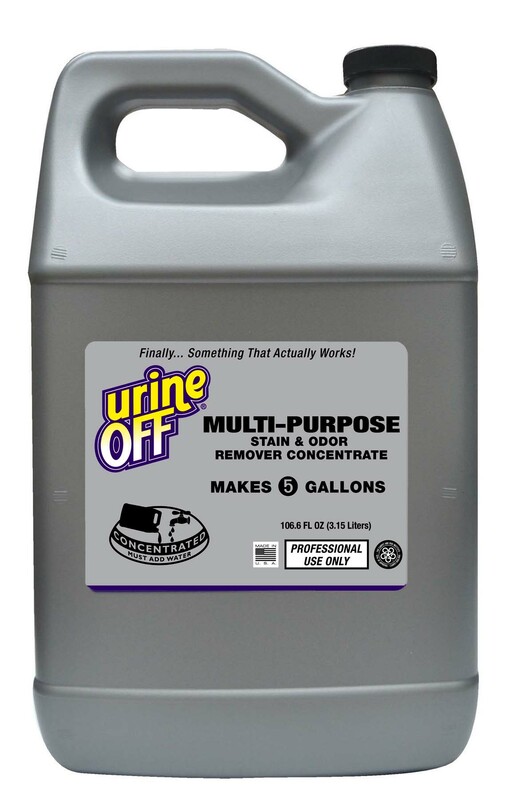 Urine Off is a revolutionary biotechnology product that eliminates urine odor and stains at the source, permanently. Urine Off uses a combination of naturally occurring micro-organisms and their enzymes to digest the uric acid crystals (which produce urine’s pungent aroma) as well as urea (the sticky substance in urine) and proteins (which promote pathogen growth).